When it comes to parenting, affirmation isn’t the only thing . . . and it isn’t everything, but it is vital to the healthy emotional development of our children. To maintain a spirit of positive affirmation in our home, I have to focus on this need because it doesn’t always come naturally. Do you recognize the need to build up your children every day, too? 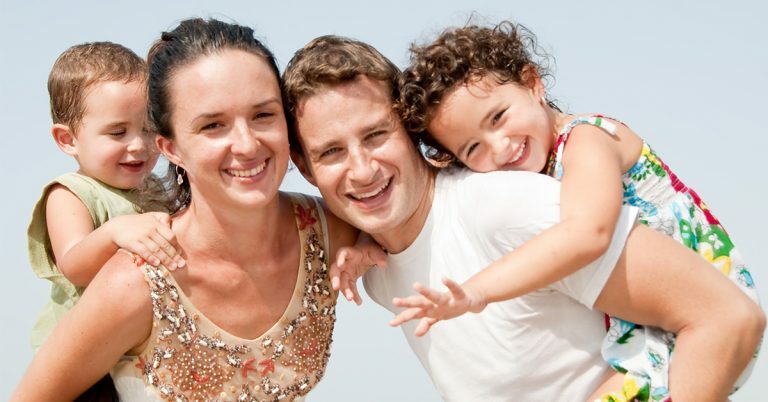 This list of phrases will encourage the child who hears them from a sincere parent. 1) I think you’re fantastic! 2) You did a great Job! 3) Thanks for being such a great kid! 4) You make me smile. 5) I appreciate the young man (woman) you are becoming. 7) Spending time with you reminds me of how special you are. 8) Would you like to go to the store with me? I like it when you come along. 9) You are an interesting person. 10) I like how your mind works. 11) Thanks for being such a hard worker. 12) You are a great example. 13) I was just telling Dad/Mom how proud I am of you. 14) I’m grateful God gave you to me. 15) You did that so well. 16) Great job on your homework! 18) You see things really clearly. 20) You give the best hugs. 22) That was a really kind thing to do. 24) Thank you for honoring me. 25) You’re a great person. 26) You are the kind of friend I wanted when I was your age. 29) I appreciate you so much. 30) You are a diligent young man/woman. 31) You make me laugh! 32) You’ve got a great sense of humor. 33) You did that? You’re amazing! 34) You are an honest young man/woman – God likes that. 35) Wow! You did a great job cleaning your room! 36) You made this all by yourself? It tastes fantastic! 37) What a great idea! 38) You’ve got a lot of ‘grit’! 39) I’m happy when you’re around. 41) I’m really proud of you. 42) You have a big heart! 44) You inspire people when you do things like that! 45) When you did ( ) it showed a lot of self-discipline. 46) How did I get the Best Kid In The World? 47) I just know you’re going to be successful. 48) You have some amazing gifts. 49) You can achieve anything you desire. 50) God created you for a special purpose. 52) I don’t know where you’re going to end up, but it’s going to be awesome! 54) I love how you never give up! 55) You could run a small country! Maybe a large one!! 56) You have strong character. 57) King Solomon talked about you: A man skilled in his work will stand before kings. 58) You’re one in a million! 59) My respect for you is really growing. 60) I don’t deserve a daughter/son like you! 61) You make being proud of your son/daughter so easy. 62) You could be President! 63) Keep practicing like that and you’re going to be the best in the world! 65) It takes a big person to be honest like you just were. 66) I know you can conquer your fear! 67) You’ve got what it takes! 68) You’re a real go-getter! 69) Do you know how rare people like you are? 70) You’re really polite – I like that in a young man/young woman. 71) You do quality work! 72) I’m grateful for you. 73) You are a blessing to me and Mom/Dad. 74) There is no one quite like you. 75) How did you come up with that? 76) It’s a rare thing to find someone trustworthy like you. 77) I know you can figure it out! 78) You worked until the job was done – impressive! 81) You are a special individual. 82) God wanted to bless me so He gave me you. 83) What a great job you did! 84) I know you will achieve your dreams. 85) This world would be a better place if more people were like you. 86) You figured this out by yourself? Amazing! 87) What you did for your (me, friend, brother, sister) was really kind. 88) Grandpa and/or Grandma think you are spectacular! 89) You are going places! 90) You showed a lot of maturity when you responded like that. 91) I can see your future . . . it’s so bright, I’m going to need sunglasses! 92) You are the son/daughter I prayed for. 93) Every parent wishes they had a son/daughter like you. 94) I don’t know what I would do without you. 95) I love the fact that I can rely on you. 96) Dad/Mom and I were just talking about how wonderful you are. 97) Thank you for loving me. 98) I can see your inner strength. 99) You stood for the Truth – that’s what good men/women do! 100) Awesome – that’s what you are! Dad & Mom, you have a powerful voice in the life of your child. Our kids aren’t perfect but if we’re paying attention, we can catch them in their best moments. Just think what a positive difference saying a few of these each day will make in the heart of your child. 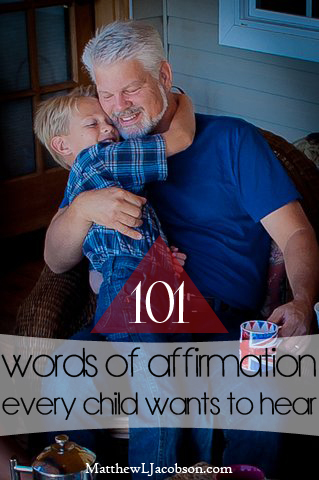 "101 Words of Affirmation Every Child Wants to Hear"
P.S. 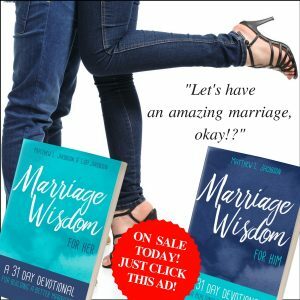 You might also enjoy 103 Words of Affirmation Every Husband Wants to Hear and 102 Words of Affirmation Every Wife Wants to Hear.